← The Triumph of the Will to Intuition. 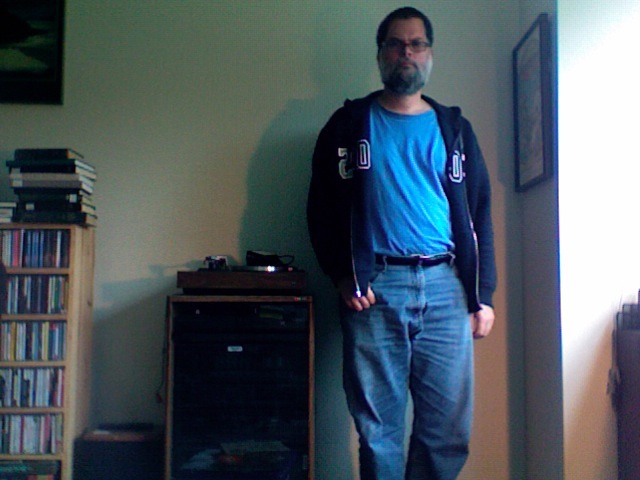 . .
At one point I had to talk to Peter Burkholder about some department matter and apologized for dressing in a manner unbecoming to a musicologist. He told me that an old professor of his dressed in the coat-and-tie professorial style, but sometimes changed it up with Western wear. Students puzzled over this incongruity and had managed to assimilate it to their collective perceptual framework when the professor changed it up on them again and wore a suit and tie with cowboy boots and a ten-gallon hat. 1. Dress in the style you deem most “professional” for your work environment every day for a long enough period of time (days, weeks, months) for that style to become commonly associated with you. Believe that “clothes make the (wo)man” and style your persona accordingly. Become the person whose image you project. Be sincere. 2. Come to work dressed in a way you only ever do in front of your friends and family. Style your persona accordingly. Be sincere. 3. Come to work dressed in a way that combines aspects of no. 1 and no. 2. (Coat and tie with birkenstocks, for example.) Be sincere. What kind of person are you now? How can one hide one’s own disbelief in an intended act of private deception? Is it not absurd to say to oneself, ‘I don’t believe such-and-such and yet I am going to believe it?’ One cannot be an authority for oneself, and nothing that I know that I disbelieve can be a reason for me to believe it. And how can I fail to know my own disbelief? But as Black goes on to note, we do become our own authorities and hide our disbelief from ourselves. As you can probably tell, I’ve gotten really into these game-piece/event-score/ritual exercise whatchamathings lately. (I sense the possibility of writing something on the subject that covers this ground from a different angle than Liz Kotz, but it’s still a bit vague in my mind. More later.) I’ve started trying to collect as many examples as I can. Daniel Wolf suggested that I check out a book from 1979 called Water in the Lake: Real Events for the Imagination, which is a whole anthology of such things. I ILL’d it and it’s pretty neat. That book pointed me in the direction of an anthology of scores called Scores: An Anthology of New Music, edited by Roger Johnson. I suspect there are other such collections out there; any recommendations you might have would be welcome. Become a Nazi for thirty three minutes. Believe that all politics is a matter of strength, stealth, and treachery: that all liberalism is hypocrisy or folly. Plan a campaign to take over the world by force and fraud. *Or to test the limits of your employer’s patience. This one works best for academia, where people expect you to act weird. **Modest in the sense of time and energy commitment: some of them are crazy instructions like “take a course on kung-fu or karate for at least three months, then re-read this whole chapter. You will be surprised at how much more every sentence will mean.” Actually, that’s pretty cool, but I’m still not going to do it. I wonder if a reception history might be in order for Event Scores/hyphen/hyphen, because I’d suspect that–when true self-deception isn’t part of it–the whole event comes off very smarmily. And yet (if this isn’t a contradiction in terms) in “the best” Fluxus happenings, an almost aggressive earnestness informed the performers, to REALLY make that straight line and to REALLY follow it. I work for a high-tech company, and, Phil, you’d look like any other software engineer or tech writer if you showed up dressed like that. The last time I saw our CEO around campus he was wearing beige chinos and a blue button-down shirt; no tie; loafers. The last time I saw the founders of the company, they were wearing blue jeans and t-shirts. I saw the author of this book on the Colbert Report, and he did some things similar to the Prometheus Rising book, although seemingly not as extreme or with as much intent to shift his own modes of thinking or existence. http://www.amazon.com/Guinea-Pig-Diaries-Life-Experiment/dp/1416599061. Seems interesting enough though – I really liked his “experiment” (as he calls them) to live theocratically by George Washington’s 110 Rules for Civility. Gee. MY professors, in the 80’s yet, dressed like that. No worries, man. You’re Nazi reference reminded me of an old joke: Did you hear about the new Chinese/German restaurant? The food’s good, but an hour later you’re hungry for power. Composers James Saunders and John Lely are working on a major project about prose scores (see here: http://www.textscores.co.uk/ ). The web site http://uploaddownloadperform.net is a useful site for contemporary prose scores (some of mine are there) and Frog Peak Music has recently placed the very important Christian Wolff Prose Collection online here: http://www.frogpeak.org/unbound/wolff/wolff_prose_collection.pdf Other major historical models are the scores used in the Fluxus movement (including the Pieces 1960 and 1961 by La Monte Young), Pauline Oliveros’ Sonic Meditations and, in a different spirit, the two collections of “intuitive” music by Stockhausen. While beginning as a composer with the models of Cage, Wolff, Young, and Fluxus, Ken Maue himself went in a therapeutic direction, which connected, in the 1970’s, to exercises for “values clarification” and the like which were widely used in educational, therapeutic, and in business settings. Thanks so much, again, for these resources. Some I knew about, but a lot of this is new to me. The thing that I find really interesting is how short a trip it is from the avant-garde artworld to the self-help section of the bookstore. As you note, Maue’s book is an amalgam of both tendencies. Text scores seem to mark the ground where composition, musical performance, poems, rituals, theatrical Happenings, visual art, games, therapeutic exercises, spiritual exercises (etc.) all meet. It seems impossible to say exactly what kind of phenomenon we’re talking about; it seems to lie at an ontological point prior to specialization. “. . . it seems to lie at an ontological point prior to specialization.” For me, that’s a terrific formulation and a very helpful tool when thinking about music, music making, and music therapy. It also encapsulates why I’ve enjoyed this blog so much over the years. Your posts often speak of music in a way that’s very clear and thought provoking for a non-specialist. Once a while back you mentioned not having the audience of fellow musicologists you’d hoped for, and this might be the part of the reason why that is. Thanks, Lyle. It’s very cheering to discover the kind of readership we get here — a nice mix of musicologists, composers, theorists, therapists, performers, students, etc. — along with our non-academic and non-music-professional people. Actually, the thing I was griping about before was the lack of musicology blogs, but I guess I don’t mind that now. Disappointment is the great teacher, as Chogyam Trungpa once said; you realize you have to adjust your ideas about reality to reality itself, which in this case for me means being grateful for the good things I actually find as a result of doing this blog, not the good things that exist only in my imagination. very very interesting! – perhaps because i have been thinking constantly about this (minus the research). i’m particularly interested in the possible linkage (or affinity?) between the historical music avant garde, and the new age/psychedelic/religious, in what i perceive as a fascination with shifting/altering belief systems, often with exercises that “practice” this with temporary states of [dis]belief. i think oliveros’ sonic meditations mark a very interesting moment, where performance text scores began to resemble guided meditations. it’s fun for me to then go back to the text scores of fluxus and view them under a similar lens. if you (or anyone) has any suggestions for further research i could pursue into the field of belief systems within the avant garde of music, performance, religion, and ritual, i would be most grateful.